Formerly of Nicks, the Manor, and the Dock, Chef Joel is a common face around MTK and well known for his fine cuisine. Embracing his new adventure, Chef Joel is busy creating spectacular daily specials from local products…in addition to the regular lunch, dinner and price fix menus. On a chilly March evening, we had the pleasure of enjoying many of his creations along with a few specialty cocktails from Jeff and Ali behind the bar. 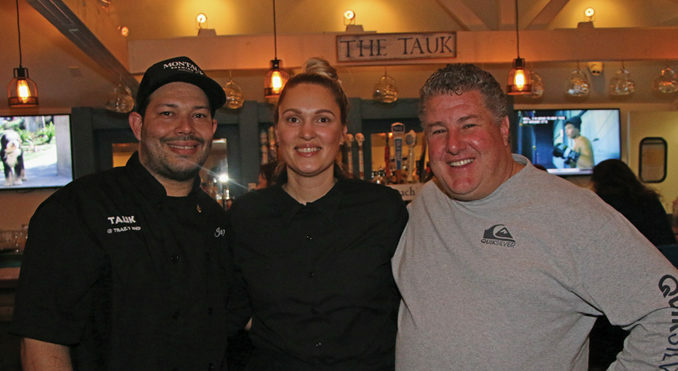 Utilizing local brands in their mixtures as well as MTK brew on tap shows TAUK’s appreciation of the Montauk community and all it has to offer. Montauk Rum Runners Coconut Rum and Citrus Gin make the Rumrunner Punch and the Gin Blossom memorable. While the Hard Blue Montuak with Montauk Blueberry Hard Whiskey is like drinking a blueberry lemonade. In addition, the Bini Tini- a play on a dirty martini- includes the beans and juice from Montauk Pickling Company. Sipping these delicious treats while munching on crispy bread with a flavorful herbed oil was a great beginning to a lovely evening. Joel decided to send ‘a few’ of his favorite appetizers for us to try. I think he could have stopped at the Mussels because they were unbelievably fresh, clean, and soaking in a light white wine and garlic sauce. 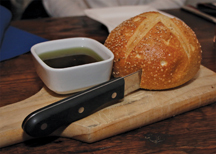 The aromatic flavor of the sauce was not only perfect for dipping bread into, but also accented the natural character of the mussels without overtaking the dish. If you like a smoky bacon blended with herbs and chopped clams, then his Baked Clams are a perfect choice. Fish bites with a twist, the Halibut Buffalo Bites are both tender and spicy. 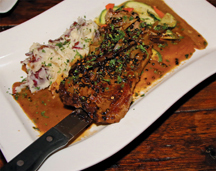 While the crisp, tender and flavorful BBQ Ribs are fall of the bone delicious. So at this point most people would have savored the delicious appetizers and called it a night, but we had a job to do! Wanting to have an array of options to tell about, we decided on the Eggplant Parmigiana from the Price Fix menu, the NY Strip Au Poivre from the main menu and the Fluke Franchise from the evening’s specials. Served with a bowl of al dente pasta, the eggplant was prepared to perfection; lightly breaded and accented with cheese allowing the fresh flavor of the eggplant to be prominent. Having been spoiled by my mother’s Au Poivre sauce I rarely find one that I enjoy as much as hers. Of course I can’t tell her, but this light, creamy peppery sauce poured over a, cooked to order, tender strip steak was delicious. Although we loved each dish, the Fluke Franchise was the table favorite. The beautiful presentation was as enjoyable as the taste. Gently cooked in a light lemony Franchise sauce and surrounded by fresh mixed vegetables and creamy mashed red potatoes, this generous piece of fluke looked too good to eat. Now in their second year, Tauk @ Trails End is making their mark by offering a welcoming environment to enjoy good food, friendly faces, and tasty libations. 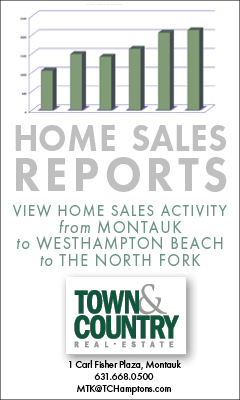 Lunch and dinner is served daily in either the remodeled dining room with a casual rustic Montauk décor, or when it warms up, out front on the quaint deck or in back on the spacious private patio. Recently, part of the décor of the dining area has been dedicated to local artist Candace Ceslow. Happy hour is 4-7pm everyday- stop by and enjoy! Artist Candace Ceslow is a painter, currently residing and working in Montauk, NY. She graduated from Adelphi University in 2012, with a Bachelors in Fine Art. She is inspired by nature – both sea and land. 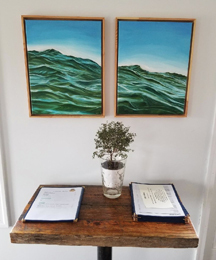 Candace’s work has been exhibited in galleries on both the South and North Fork of Long Island, in Rochester, and Brooklyn, as well as various cities across the United States. Growing up on the eastern end of Long Island, the ocean has played a major role in my personal and artistic development. It is a place of continued rejuvenation, wonderment, and beauty but also a space of deep unknowns and, at times, tumultuous surf. It is this conflict that has inspired the Salty series. I started painting the ocean because I wanted to explore contradicting emotions that emerged from the water. The rhythm of the waves can be calming and meditative. Listening to the water crash and flow, getting lost in the ripples of the ocean, the stresses of daily life go out with the tide. The serene water scenes I paint often do not depict land. You are alone, drifting in the boundless ocean, lost at sea. The strength of the wind and water can be menacing. The waves are ready to be worshipped. They are deities ready to crash and pull you under as sacrifice. Like the ups and downs of the ocean, my work explores the dynamic between the beauty and defenseless-ness that the water can evoke. Are you at peace floating in the water or are you vulnerable to the vastness of the blues and greens? Her work explores the contradicting emotions that emerged from the sea and ocean. The water can have a meditative and calming effect on you but the vastness can also be frightening. Her work examines the dynamic between the beauty and defenseless-ness that the water can evoke.